Michael Thistlewood has published the results of the 2015/16 Season. Frank McMahon and Russell Sherwood share the honours in the email tourney with 5.5 points each. R.D. 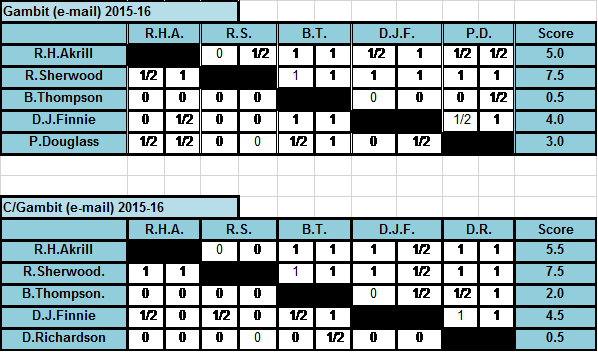 Picken and David Richardson also share the honours in the postal tourney with 6 points apiece. Well played to one and all. Your support of the ‘End Game Tournament’ is most appreciated by Michael. Congratulations to Russell Sherwood on winning both Tournaments with a near perfect 7.5 points. Richard Akrill is the runner up with a very respectable 5.5 points. Gambit Tournaments are unrated and should be played without computer assistance. They are designed to increase the understanding of particular positions. Members who also play OTB may find them of particular benefit. The 2016/17 Gambit Tournaments are open for entry now – please contact Fred Clough for more details. Membership renewal is now open for the 2015/16 season on the website. Look out for the new ‘Free to Enter’ Rapid Play Cup which is on the renewal form. Pay your membership fee and make your choice of seasonal tournaments on the payment page. Don’t delay do it today. New Members are also welcome at anytime. Michael Thistlewood reports that the winner of the ‘End Game Tournament‘ and the £5 cash prize is Paul Douglass with a score of 5.5 – well played Paul. Maurice Carter on a clean sweep of 4/4 in his first Class 1 Webserver Trio No.87 – very well played. Maurice is now promoted to Class 2 and has been awarded 2 BCCA Candidate Master Points. Class 1 Webserver Trio No.90 has resulted in a draw between Helen Sherwood and James Rothwell, both players are therefore promoted to Class 2 and share the BCCA Candidate Master Points receiving 1 point each. Congratulations to David Howell on winning Class 1 Trio No.89 with a perfect score of 4/4 – well played. David is now promoted to Class 2 and has been awarded 2 BCCA Candidate Master Points. Robert Bruce has won Class 1 Trio No.89 with a clean sweep of 4 wins, Robert has now been promoted to Class 2 and has been awarded 2 BCCA Candidate Master Points. Congratulations to Dennis Broadway on a well-crafted win in Class 2 Trio No.33 with a score of 3/4 – Dennis has been awarded 4 BCCA Candidate Master Points and promoted to Class 3. Geoffrey Herbert and Raymond Burridge share the honours in Class 2 Trio No.44 with a tied score of 2.5 pts, 1 win and SB of 4, Geoffrey wins promotion to Class 3 (Raymond is already in Class 3) and have been awarded 2 BCCA Candidate Master Points each. Although the BCCA no longer holds a Best Game competition, BCCA English members are allowed to submit games to the EFCC (English Federation for CC) Best Games competition. See the EFCC website News item of February 10 for full details. 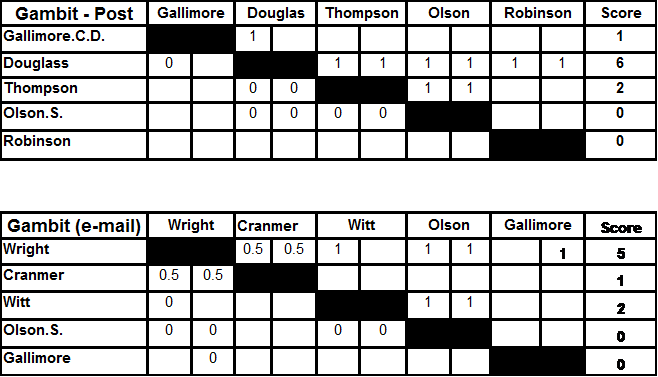 Douglas and Wright are in strong positions at the halfway point, only Galimore and possibly Robinson can challenge Douglas in the postal tournament. The email tournament is a little more open. We have just reached this milestone in the Webserver Trios Tournament and would like to thank all the members who have taken part and continue to support the tournament. 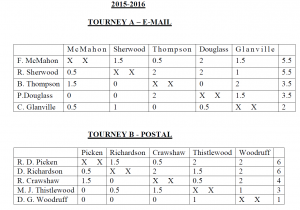 If you are chasing your BCCA Titles the Trio’s tournament is a good source of BCM and BM Points in Class 3. Congratulations to Bill Clews on winning the tournament in a close fought finish with Colin Cheek. Bill scored 8.5 points and 8 wins and Colin finished on 8 points with 7 wins. Bill receives 5 BCM points and the engraved Bronze Medal, Colin receives 3 BCM points. Bill will play in the ‘Silver Tournament’ next time. As an added bonus, Bill Clews has now accumulated 26 BCM points & is therefore awarded the BCCA Candidate Master (CM) Title. Congratulations to Bill!